Lint in your sewing machine is the natural consequence after hours of time spent sewing. 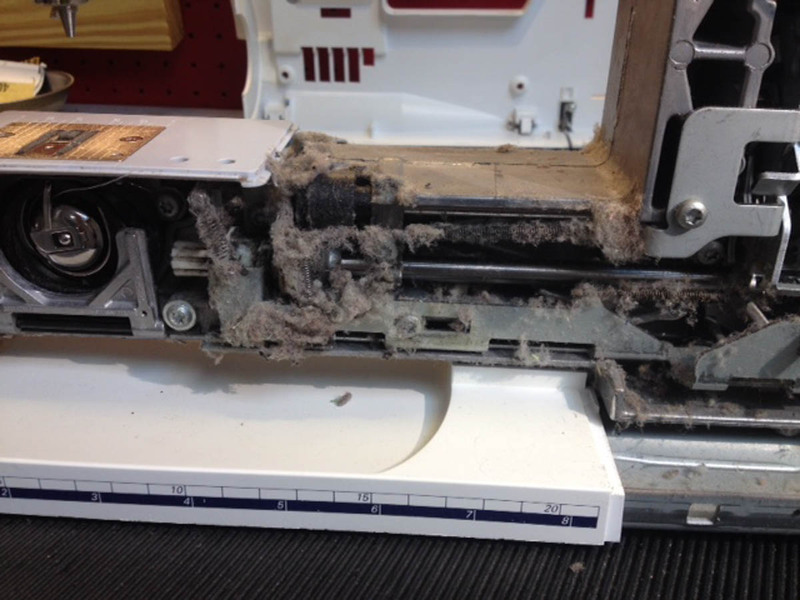 Cleaning and removing lint is a key item on your regular machine maintenance checklist. You might think that using compressed or canned air to remove lint is a quick and easy solution. But don’t reach for that can so fast, read on to find out how cleaning your machine using compressed or canned air can affect your sewing machine! When using compressed air or canned air to clean your sewing machine, where does all the lint go? 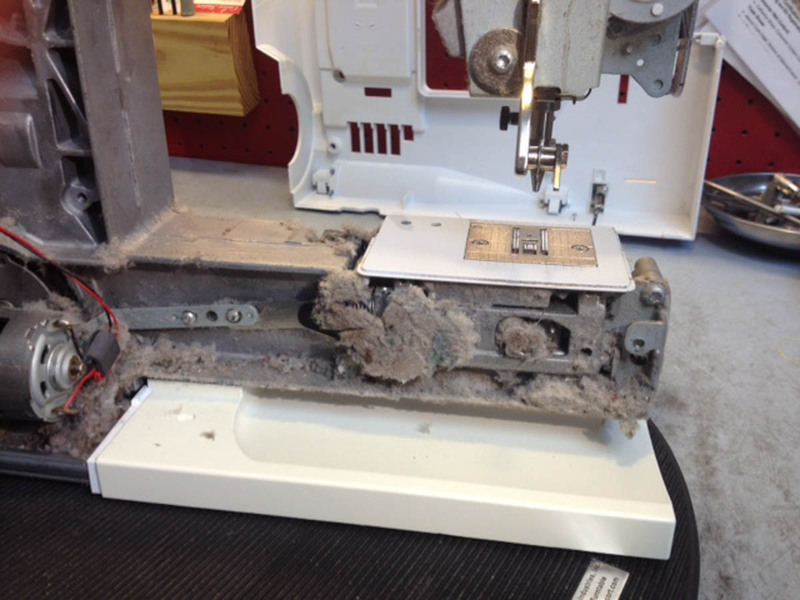 The hook area might be free of lint, but most lint ends up in areas where usually no lint ever accumulates, deep inside the machine. That lint accumulation over time could become an issue and negatively affects the performance of your machine. As you can see in the picture, the hook area is perfectly clean and on the right hand side with the covers removed the lint is packed in. We recommend not using compressed air for cleaning for obvious reasons. Using the cleaning brush provided by the manufacturer or using a larger soft brush is effective as anything else. In general we recommend to have the machine serviced once a year by an authorized store. Read more machine cleaning tips here on WeAllSew and watch for more tips form expert technician here on WeAllSew. Previous Previous post: Sewing with SewGlow, an Experiment! Next Next post: Duvet in a Day! This picture looks like either a machine used for industrial purposes, or someone who sews many hours each day. Taking a machine to the dealer, especially an electronic one can be expensive. If you don’t use the machine but a couple times a week, soft brush out (not canned air as article points out as well) should be used and I take mine in for an overhaul every two years. 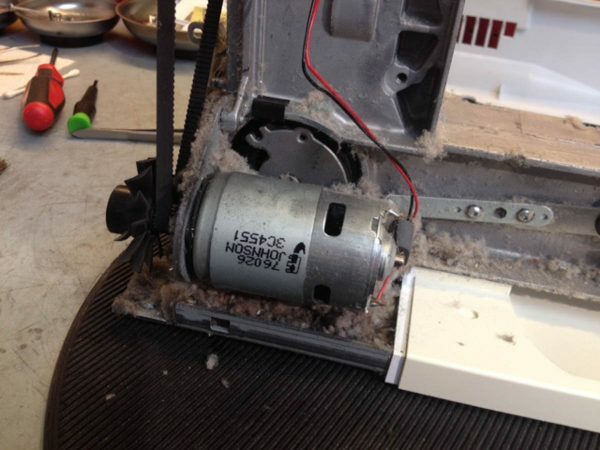 On electronic computerized machines, canned air is even more dangerous as it can blow dust and lint into the electronic boards and components, creating a very expensive problem, possibly even ruining your machine. This is a good article and would love to see more from Bernina on machine care. My heart dropped when I say this. I just wanted to run for my micro vacuum. I was told to use a mini-vacuum to clean. I’m scared to death to use it. Can you please give some instructions on how to use it? A miniature tip with a brush on the end of the vacuum cleaner hose is preferred in order to get into the small openings of the hook area for cleaning. Clean where you see lint, usually underneath the feed dogs, on each side of the hook and behind the hook, also remove the bobbin case and hook if possible. After each cleaning lubricate the hook according to the manufacturer’s specifications. Personally I prefer vacuum cleaner attachments that are being used for cleaning computer key boards. Take a look at the Micro Vacuum Attachment Kit No. 7625 from Brewer http://www.brewersewing.com/p-261832-micro-vacuum-attachment-kit.aspx or at visit a computer store. Thanks for the reminder! I use my machine dsily now and need to be cleaning it out more often. I find that Medscand Cytobrush Plus (used to do pap smears) does a great job getting the lint out of the cramped and tiny spaces. Ask you GYN for a couple. A friend gave me a pipe cleaner and it picks up lint well. Is it a good idea? Please be careful, the pipe cleaner has a metal core that could potentially scratch the parts surface. A quality brush or a mini vacuum cleaner removes the lint more gently. My 880 is very heavy for me to take in for a cleaning very often. I love my 880 but really didn’t think about the heaviness for repair etc. when I bought it. Is there a way that I can open the arm a little self and vacuum with a mini vacuum to clean it out myself? I have never used any canned air on it at all. Your BERNINA 880 hook area is already very accessible, there is no need to remove any covers. To clean, simply remove the needle plate, then using a good brush or a mini vacuum cleaner. Then lubricate the hook and you are good to go. Please consult the User Manual, there are additional basic maintenance procedures listed such as: Hook cleaning/lubricating, needle threader cleaning, thread cutter cleaning etc. Please stay away from canned or compressed air, it is the worst that can be used to “clean” the machine. The lint particle are being blown deep into the machine and accumulate.